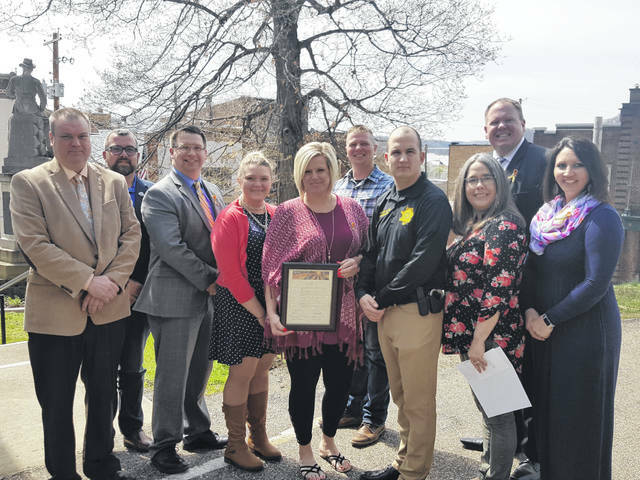 Representatives from multiple agencies in Meigs County came together to show their support for victims of crime by the signing of a proclamation. Pictured are (from left) Director of Meigs County DJFS Chris Shank, Commissioner Randy Smith, Prosecutor James K. Stanley, Victim Advocate Alexis Schwab, Victim Advocate Shelley Kemper, Commissioner Jimmy Will, Investigator Michael Oliver, Children Services Supervisor Terri Ingels, County Court Judge Mick Barr and Clerk of Courts Sammi Mugrage. Investigator Michael Oliver was presented a certificate of appreciation by Prosecutor James K. Stanley for his work to serve victims of crime in the county. POMEROY — “Honoring Our Past. Creating Hope for the Future” is the theme for National Crime Victims’ Right Week which is observed April 7-13. On Thursday, the Meigs County Commissioners approved a proclamation in observance of the week, which was also supported by many county officials. Signing the proclamation with the Meigs County Commissioners, Common Pleas Judge Linda Warner, Juvenile and Probate Judge Scott Powell, County Court Judge Mick Barr, Prosecutor James K. Stanley, Sheriff Keith Wood, Crime Victim Services Director Theda Petrasko, and Children Services Supervisor Terri Ingels. According to the proclamation, Americans are the victims of more than 20 million crimes each year, impacting the lives of individuals regardless of age, origin, race, religion or other demographics. In Meigs County, there were 516 new victims of crime in 2018. During Crime Victims’ Rights Week a display of shoes will be placed on the Pomeroy Parking Lot with each shoe representing one of the victims of crime. The shoes will each be tagged to state the type crime the person represented was a victim of. National Honor Society members from Eastern and Southern will take part in setting up and taking down the display, respectively. In addition, the Homicide Victim Memorial will be on display in the parking lot. The public is also invited to pick up ribbons on the third floor of the courthouse or at the prosecutor’s office which are in the colors of blue, gold and orange, the colors to represent National Crime Victims’ Rights Week this year. “When victims feel understood and supported, they are more likely to seek services, which leads to a stronger and more resilient community,” the press release concludes. 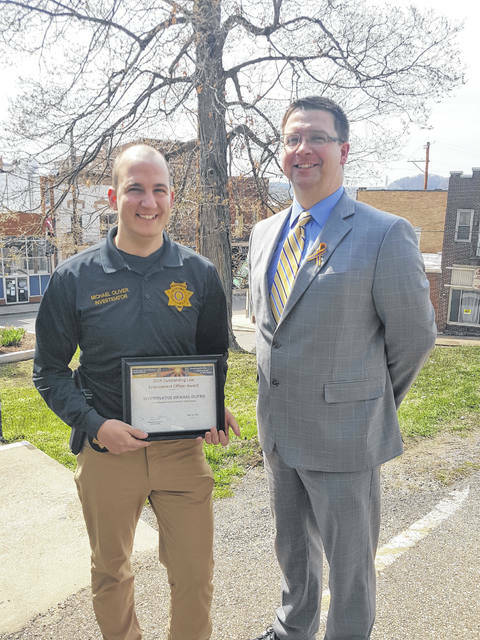 After the proclamation, Prosecutor Stanley presented a certificate to Investigator Michael Oliver for his work on behalf of crime victims in Meigs County. Stanley stated, that since beginning as the investigator at Job and Family Services through the Prosecutor’s Office the amount of cases being brought forward to the grand jury has increased tenfold. In addition, Oliver works as a police officer in the Village of Syracuse and helped with the investigation of an arson case in the village. Through his role as an investigator, Oliver has investigated cases through Children Services, as well as fraud cases for the agency. The traditional Crime Victims’ Rights Week ceremony is not taking place this year as the Attorney General’s Office did not award funding for such programs, said Prosecutor James K. Stanley.